I recently bought my first impact driver and wanted a good way to hang it over my workbench. I saw some of these online and figured I could probably handle that. It was a full “winging it” style project that I made up the dimensions and plan for as I went, but it works perfectly for what I need. 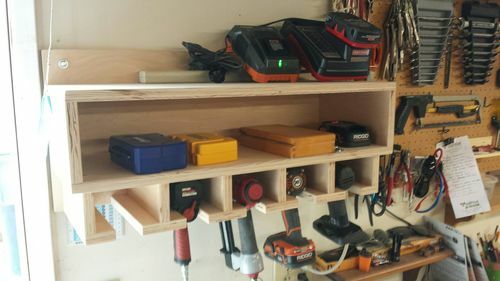 I left one uncut cubby on the bottom in case I get any other tools that I’d like to keep up there in the future. Everyone needs one of these. Good Job on this. I saw some of these online and figured I could probably handle that. It was a full “winging it” style project that I made up the dimensions and plan for as I went, but it works perfectly for what I need. Makes the journey much more enjoyable, and when you arrive gives you a greater sense of accomplishment. Cause now you can say I built that, after I designed it, and laid it out. Yep! Everybody needs one of these. I built mine with 5 bays and keep my drills and nail guns in it. One of the more useful shop projects I have made. Nail gun is a great idea! I may have to add that into mine. Thanks for the positive comments.